Big kids and little kids alike, if you like to play sports like Football, Soccer, Ice Hockey, Boxing, or any other extreme sport, you should consider a piece of equipment to protect a very important body part – your mouth. Your dental professional at Lorne Park Dental will be able to custom fit a mouthguard specifically to the shape of your mouth. This will offer a layer of protection for your teeth and mouth against damage caused by impact. An impact may happen with another person on the team, an opponent, a piece of sporting equipment, or even a hard surface… like the ground or a tree! Here are a few tips for making sure your mouthguard is giving you the best possible protection. Wear your mouthguard during practice and the game. Make sure your mouthguard is made by a professional for the best fit. Call Lorne Park Dental to book your appointment. Choose a bright colour for your mouthguard so it can be found in the field or on the ice if it falls out. If you wear braces, a mouthguard will help prevent lacerations to your tongue, lips or inside of a mouth. Take out any removable mouthpieces (i.e., retainers) before putting in the mouthguard so that it fits properly. Store your mouthguard in a hard case to protect it when travelling. Clean it! Rinse with mouthwash or cold water before and after each use. Using a toothbrush and toothpaste is also advised for proper cleaning. Next time you are scheduled to see the dentist, make sure you take your mouthguard to have the integrity and fit assessed. Your sports mouthguard will help protect your teeth while playing your extreme sports and activities. Take good care of it, and it will take care of you! Don’t chew on it! Pack a little extra for a mid-game snack if you are hungry. Don’t try and eat your mouthguard. Don’t leave it out in the sun! We don’t have sun protection for your mouth guard, so when not in use, keep it out of the sun. Exposure to direct U.V. rays and heat from the sun can cause premature damage to the mouthguard. No hot showers for your mouthguard! 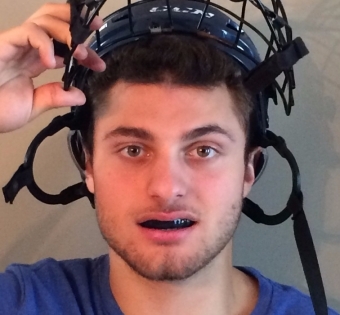 You may not like a cold shower after a game, but your mouthguard does. No hot, confined spaces! Let it breathe! Just like your body after a workout, it likes to feel the cool breeze. Don’t leave it in the glove compartment of the car, or in your sports bag that is left out on the side of the field during a hot summer game. At Lorne Park Dental, we love to see our kids (little kids and big kids!) stay active, healthy and happy! We also know the importance of keeping the mouth and teeth protected. If you have any questions about whether or not your lifestyle requires a protective mouthguard, please do not hesitate to contact our office today to book a consultation.